Need an afternoon pick-me-up? 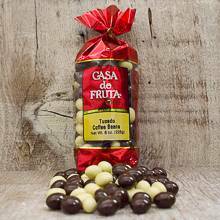 This mix of white chocolate and dark chocolate covered whole espresso beans can help. Just three can give you a mighty boost! Packaged in an 8 oz. bag. NOTE: SHIPPING RESTRICTIONS APPLY: DURING WARM WEATHER CHOCOLATE GIFT PACKS CAN BE SHIPPED MON/ TUES/ WED, OVERNIGHT OR 2-DAY AIR ONLY on chocolate products starting May 1st through October 16th. Occasionally, weather can be unpredictable. If the weather in delivery area is above 80 degrees during any month of the year we suggest the package be expedited.